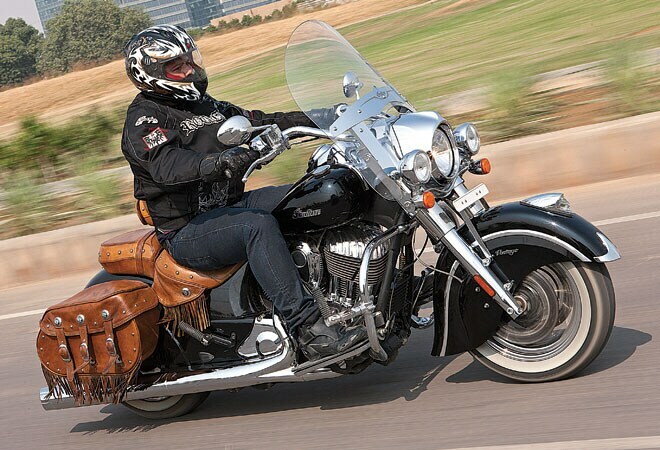 The Indian Chief Vintage is a gentle giant. Ride through history as it repeats itself. The Indian Motorcycle Manufacturing Company enjoyed renown among two-wheeled speedsters, especially in the early part of the 20th century, when it set various land speed records in the USA and UK. However, the ride turned bumpy in the following years, and its production finally screeched to a halt in the aftermath of the Second World War. The great Indian had gone bankrupt. Many tried resurrecting the brand over the years, but with little success. It was only when Polaris designed and engineered the new Chief range in 2011 that the Indian finally announced its return, and how! The new Indian Chief Vintage is aestheticism personified, from its one-of-a-kind styling to curves that evoke admiration (for once, it won't be the lady riding pillion that everybody will be looking at). 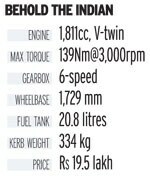 And while it's understood that a 348-kg monster needs the brawn to handle it, the Chief's well-sorted suspension makes it ride like a much smaller motorcycle. As for the engine, its performance is said to be a veritable treat for the rider's soul. Still, it was something we had to find out for ourselves. The first thing that strikes you about the Chief is its sheer physical enormity. You can't help but think that if the motorcycle were alive, it would swallow you whole and not even let out a burp. You don't sit on this baby, you sit in it. It is over two metres long, weighs almost half a tonne, and has handlebars wide enough to give a sumo wrestler a big bear hug. At the front sits a massive headlamp, flanked by equally large fog lamps and topped by a giant windshield. Two massive saddle bags hang on either side of the pillion seat. The design of the motorcycle, especially the massive white walled tyres and mud guards that cover almost the whole wheel, can be traced back to the early forties. However, the 'vintage' part of the motorcycle ends at the looks, as far as the instrumentation is concerned. The right-hand controls of the Chief include an emergency flasher button, the run-stop switch, the starter button, and cruise control system switches. The electronic cruise control is intuitive yet simple, using a separate on-off button coupled with a single pivoting switch for the purpose. Punch the start button on the tank, and the Chief comes to life with a loud yet pleasant thump. Twist the throttle and you hear the massive 1,811cc engine roar, and then pound impatiently against the metal body. The V-twin engine of the Indian Chief scales the very heights of refinement, as far as motorcycles are concerned. It sounds smooth, sure and (most importantly) well engineered. Stamp the gear shifter into first, and you hear a loud thud as the engine settles into a rhythm you could meditate to. Smooth in power delivery and sure-footed around corners, this boy is sure to become the modern-day Chingachgook of motorcycling. The author is the Principal Correspondent, AutoBild.